Holy crap. It's that time of year again. In case you forgot that the holiday are right around the corner, the Holiday Ice Rink at the Embroidery Center is back to remind you. You know when you see uncoordinated San Franciscans falling by their backsides on the artificially placed frozen tundra at the Embroidery that Santa Claus, overeating and maxed out credit cards are just around the corner. 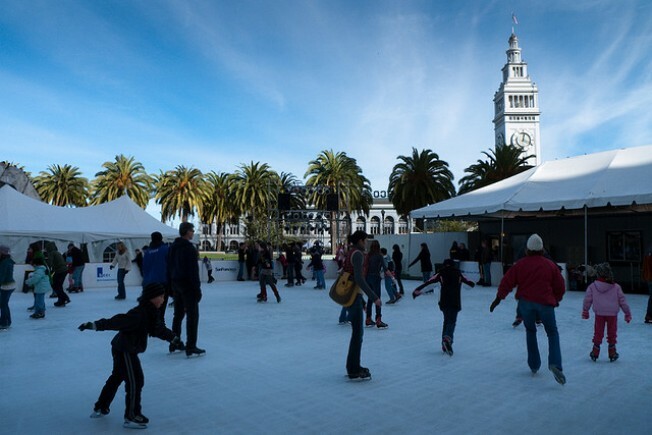 The annual holiday ice skating rink will open Wednesday and run through Jan. 2 at Justin Herman Plaza in downtown San Francisco. The rink will be open for sessions between Sunday and Thursday from 10 a.m. to 10 p.m. and Friday and Saturday from 10 a.m. to 11:30 p.m. Adults cost $9, and children under 10 are $6. On weekends and evenings, prices change, so make sure to visit the rink's website before heading out.